AND YOU WONDER WHY ESPN IS HEMORRHAGING VIEWERS? What else would one expect from the liberal ABC-Disney Television Network? The powers that be thought it a brilliant marketing move to run a promo of the TV sit-com ‘Blackish’ which bills the episode as the “election through the eyes of Black-ish.” They ran the promo during Saturday night’s telecast of the Wild Card game between the Houston Texans and the Oakland Raiders. Yes, that is correct, there actually is a TV show called “Blackish”. I know, you are asking yourself where the show “Whitish” is? C’mon man, you know that would be racist. The liberal media continues their political bias and just cannot accept the loss. How many weeks has it been since the election and the MSM is still spewing this nonsense. Instead many viewers were annoyed at a promo for next Wednesday’s episode of ABC’s sitcom Black-ish, which features a predominantly African-American cast being decidedly anti-Trump in tone and nature. In another scene, her colleague Daphne (Wanda Sykes) appears to kick out at her for merely expressing that she had chosen to cast her vote for the Republican Party. As I always say, know your audiance. However, the Libs at ABC don’t seem to understand that concept. Let’s say they got a backlash to Blackish. Yet, another reason why Trump won and Hillary lost. America is tired of the BS from the past 8 years of Obama and this plays right in to it. It’s not beyond the realms of possibility that Trump will weigh in on Twitter with his thoughts about Black-ish in the next few days. At a press conference on Tuesday, Donald Trump called out the MSM for the dishonest sleaze that they are. Wow, the truth hurts, don’t it. One thing is for certain, if the MSM goes there and does something dishonest, Trump is going to call them on it. Maybe that is a good thing that someone is actually calling the media out for the scourge that they have become? Trump went on to say, “The political press is among the most dishonest I have ever met.” Trump vows to continually attack the press. How comical. the MSM trying to tell us how Trump got it wrong about them. On Tuesday, Trump pointed out ABC News reporter Tom Llamas and called him “a sleaze.” Llamas’ crime? Asking the presumptive Republican presidential nominee to explain why he had misled people about how much money he’d raised for veterans. The attack, which came amid one of Trump’s familiar diatribes about the “dishonest” media, was the latest in a string of personal insults Trump has made against reporters covering his campaign. Trump has called Fox News host Megyn Kelly “a bimbo.” He dubbed NBC’s Katy Tur, “little Katy, third-rate journalist.” He has also individually tweaked reporters from the New York Times, Politico, CNN and elsewhere. And at nearly every rally, the brash billionaire reams the press as “dishonest,” “disgusting,” “slime” and “scum,” calling political reporters the worst types of human beings on earth, prompting his crowds of thousands of supporters to turn, without fail, to jeer and sometimes curse at the press. Take a good look at the greatest failure that the United States has ever had the misfortune to be elected President of the United States. Barack Obama is a dangerous, EPIC FAILURE!!! Earlier in the day before the Paris, France radical Islamist terror attack, in an interview with ABC News Democrat media lapdog George Stephanopoulos Barack Obama stated that ISIS was “contained”. Well this might be the worst timed interview and one of the biggest lies from Obama’s lips. Oh yes Mr. President, ISIS is contained and not gaining strength, tell that to the 129 innocent people killed in France on Friday and to those aboard the Russian airplane that was blown out of the sky last week by what all accounts was most likely a bomb of which ISIS has claimed responsibility. ISIS contained, are you kidding me? Obama has been an complete failure when it comes to ISIS and has just kicked the can down the road to the next president. ISIS is not gaining strength … This brought to you by the liar who told the American people, If you like your healthcare plan, you can keep it. This from the president who cannot even utter the words, radical Islam. ABC News: Obama Criticized for Claim That ISIS Is ‘Contained’. The comment came just hours before the announcement of a U.S. airstrike in Syria that had targeted ‘Jihadi John.’ But the mainly symbolic victory was cut short following the attacks in Paris on Friday in which at least 127 people were killed. During an interview on ABC’s “This Week” this morning, host Martha Raddatz asked GOP presidential candidate Donald Trump whether he owed John McCain an apology for his comments over the weekend in Iowa when he questioned whether McCain was a war hero because he had been captured. Trump doubles down and said, “No, not at all.” Trump went on to say that reporter Sharyl Attkisson defended his comments after the media onslaught and establishment Republicans. Trump said to Raddatz, “When people attack me, I let them have it back,” he said. “People are constantly attacking my hair. I don’t see you coming to my defense.” No double standard there. Isn’t it something that a RINO like McCain could be the undoing of the GOP? Get the facts correct everyone, McCain fired the first shot calling American citizens who went to Trump’s speech crazies. Where is his apology to them? Oh, but that is different, because the liberal media loves McCain and thinks it is perfectly OK in their bias reporting to call Republicans crazies. Lets get things straight, does Trump owe McCain an apology, YES. Is John McCain a war hero, YES. However, that does not mean that some one can also not call him a dummy and make comments against him. His job as US Senator is completely different than his military service. That would be like saying that if you criticize a black president for his policies, you are a racist. Oh wait, that is what the MSM does do. GET THE POINT! And just because one has military service does not mean that an individual like John McCain has the right to call people who went to a Trump speech “crazies”. Of course Trump should apologize and just say that all who serve in the military honorably are heroes. Everyone should think that. All veterans are heroes, they have sacrificed their lives in defense of the United States. All Trump would have to say in an apology is that he believes all veterans who serve honorably, whether they came home, were POW’s or paid the ultimate sacrifice and lost their lives are heroes. However, whether you are a war hero or not does not give you the right to make fun of Americans and call them “crazies”. But of course the liberal MSM will never even discuss that and shame on FOX News for going along with the pack. Are they reporters or cattle? Part of the charm of the lead-up to the New Hampshire primaries is the incredible access to the candidates. However, that appears not to be the case when it comes to Hillary Clinton. As reported at ABC News, reporters were kept behind a moving rope-line at a 4th of July Day parade in Gorham, New Hampshire. Clinton staffers actually created a rope-line so to prevent access to Hillary. UNREAL. Think about this America, if this is what she is doing now, imagine what she would do as president. So much for the media’s or peoples access to a politician. Further think of the irony, on Independence Day, at a July 4th parade where you United States celebrates its birth and victory of gaining independence from a King, Hillary Clinton marches in a parade, acting as if she is royalty. Ponder than when. The real question is why didn’t some one in the MSM just say, oh hell no you are not going to deny us Freedom of the press in America on the 4th of July by roping us off like cattle. But instead they were probably more worried about what her favorite ice-cream is. Had this bee a Republican that did this, all hell would have broke loose. 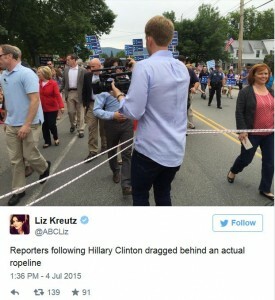 At the Fourth of July parade Hillary Clinton marched in Saturday in Gorham, New Hampshire, reporters following the candidate were kept — and at moments, dragged — behind an actual moving rope line. The rope, which two Clinton staffers held on to on either side, was meant to give Clinton space as she walked down the parade route, but photos of reporters being dragged behind the rope as she marched have gone viral on Twitter.